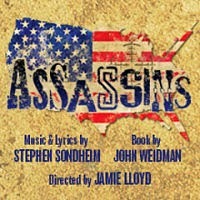 Broadway star Aaron Tveit is to make his UK stage debut in Stephen Sondheim and John Weidman's Tony Award-winning musical Assassins at the Menier Chocolate Factory this Christmas. He will play John Wilkes Booth (an American stage actor who assassinated President Abraham Lincoln at Ford's Theatre in Washington) in the production which opens on 21st November, joining Jamie Lloyd's stellar cast members including Carly Bawden as Squeaky Fromme, Simon Lipkin as The Proprietor, Mike McShane as Samuel Byck, Jamie Parker as Balladeer/Lee Harvey Oswald, Harry Morrison plays John Hinckley, Stewart Clarke as Giuseppe Zangara, Andy Nyman as Charles Guiteau, David Roberts as Czolgosz and Catherine Tate will be playing Sara Jane Moore until Sunday 8th February 2015 .Marc Akinfolarin, Greg Miller Burns and Melle Stewart have also been cast as Bystanders with more still to come. Aaron Tveit originated roles in both Next to Normal and Catch Me If You Can on Broadway, and other stage credits include Rent, Wicked and Hairspray. He also played Enjolras in the 2012 film version of Les Misérables.